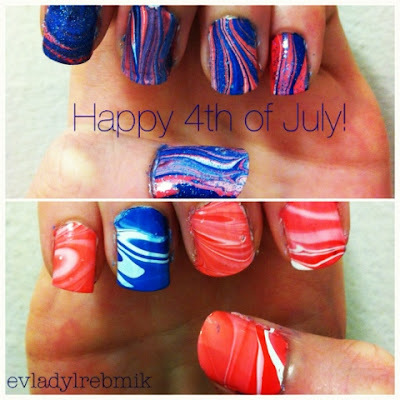 Here is a quick post of my nails to celebrate Independence Day! I wanted to do something inspired by the flag but not too literal. So, I decided to try a water marble again, thinking the colours would appear to be fabric blowing in the wind. I tried two different concepts. For the first one, I used red, white, & blue polishes for the marble and covered that with a blue glitter top coat. For the second one, I used red & white on all nails except my accent nail which I used blue & white. The polishes I used weren't the best for marbling, but I like how it turned out! I hope you have an amazing Fourth of July! I am going to miss my Jax Beach firework tradition with my mom but am happy to spend my first fourth in New York!